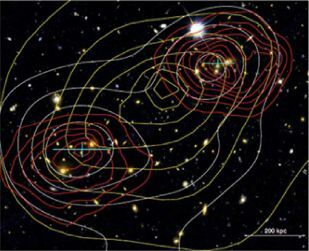 In isolated galaxies and galaxy clusters all matter components contributing to the common gravitational potential are more or less centrally-symmetrically coincident. This makes the dissection of DM from the baryonic components difficult and dependent on parametrization, as we have discussed in Sec. 3. In merging galaxy clusters however, the separate distributions of galaxies, intracluster gas and DM may become spatially segregated permitting separate observations. The visually observable galaxies behave as collisionless particles, the baryonic intracluster plasma is fluid-like, experiences ram pressure and emits X-rays, but non-interacting DM does not feel that pressure, it only makes itself felt by its contribution to the common gravitational potential. Major cluster mergers are the most energetic events in the Universe since the Big Bang. Shock fronts in the intracluster gas are the key observational tools in the study of these systems. When a subcluster traverses a larger cluster it cannot be treated as a solid body with constant mass moving at constant velocity. During its passage through the gravitational potential of the main cluster it is shrinking over time, stripped of gas envelope and decelerating. Depending on the ratio of the cluster masses, the gas forms a bow shock in front of the main cluster, and this can even be reversed at the time when the potentials coincide. We shall now meet several examples of galaxy cluster mergers where the presence of DM could be inferred from the separation of the gravitational potential from the position of the radiating plasma. The exceptionally hot and X-ray luminous galaxy cluster 1E0657-558, the Bullet cluster at redshift z = 0.296, was discovered by Tucker et al. in 1995  in Chandra X-ray data. Its structure as a merger of a 2.3 × 1014 Msun subcluster with a main 2.8 × 1014 Msun cluster was demonstrated by Markevitch et al. [57, 58] and Clowe et al. [60, 59]. This was presented as the first clear example of a bow shock in a heated intracluster plasma. With the advent of high-resolution lensing Bradač et al. [61, 62] developed a technique combining multiple strongly-lensed Hubble Space Telescope multi-color images of identified galaxies, with weakly lensed and elliptically distorted background sources. 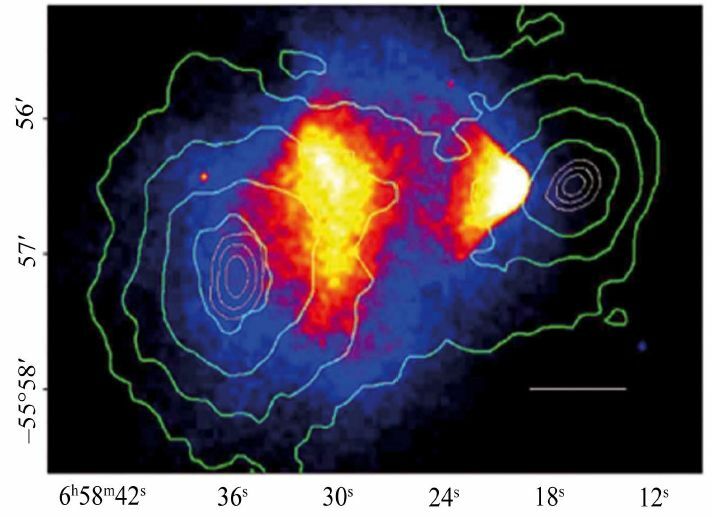 The reconstructed gravitational potential does not trace the X-ray plasma distribution which is the dominant baryonic mass component, but rather approximately traces the distribution of bright cluster member galaxies, cf Fig. 18. The center of the total mass is offset from the center of the baryonic mass peaks, proving that the majority of the matter in the system is unseen. In front of the bullet cluster which has traversed the larger one about 100 Myr ago with a relative velocity of 4500 km s - 1, a bow shock is evident in the X-rays. The main cluster peak and the distinct subcluster mass concentration are both clearly offset from the location of the X-ray gas . A recent analysis of this system  confirms the results of references [59, 60, 62], and in addition finds that dark matter forms three distinct clumps. Another merging system with similar characteristics but with lower spatial resolution has been reported by Bradač et al. , the post-merging galaxy cluster pair MACS J0025.4-1222, also called the Baby Bullet. It has an apparently simple geometry, consisting of two large subclusters of similar richness, about 2.5 × 1014 Msun, both at redshift z = 0.586, colliding in approximately the plane of the sky. Multiple images due to strong lensing of four distinct components could be identified. The combined strong and weak lensing analysis follows the method in ref. . The two distinct mass peaks are clearly offset by 4σ from the main baryonic component, which is the radiating hot gas observed by Chandra. The relative merging velocity is estimated to be 2000 km s-1. 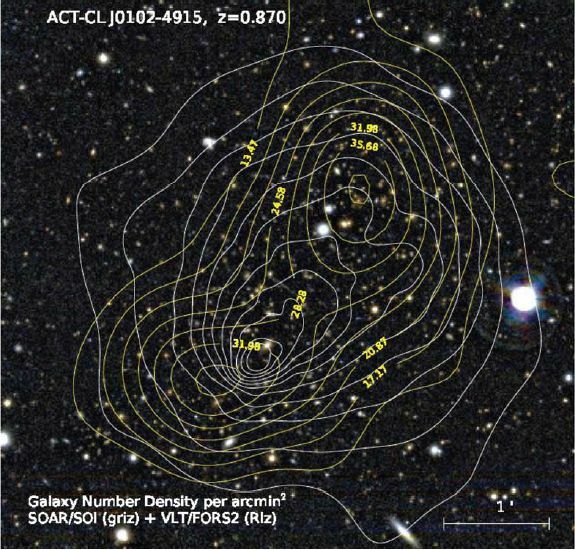 In Fig.19 we show linearly spaced surface mass density contours and X-ray brightness contours. The majority of the mass is spatially coincident with the identified galaxies which implies, that the cluster must be dominated by a relatively collisionless form of dark matter. Figure 19. The color composite of the cluster MACS J0025.4-1222. Overlaid in red contours is the surface mass density (linearly spaced) from the combined weak and strong lensing mass reconstruction. The X-ray brightness contours (also linearly spaced) are overlaid in yellow and the I-band light is overlaid in white. The measured peak positions and error bars for the total mass of the two cluster components are shown as cyan crosses. From M. Bradač & al. .
A much more complicated merging system is A1758 at redshift z = 0.279, analyzed by the same team as above, B. Ragozzine & al. , and consisting of four clusters undergoing two separate mergers. The weak lensing mass peaks of the two northern clusters A1758N are separated at the 2.5 σ level, whereas the two southern clusters are not well separated and have a disturbed X-ray morphology. There is no evidence for a merger between A1758N and A1758S in the X-ray signature and they have a projected separation of 2.0 Mpc. Note however the SZ results from the Arcminute Microkelvin Imager (AMI) in Cambridge (UK) on this system [64, 65], which sees a hint of a signal between the A1758N and A1758S. A1758N introduces a new geometry that is different from the previously discussed mergers: one weak lensing peak overlaps an X-ray peak, while the other weak lensing peak is clearly separated from the X-ray component, cf Fig. 20. Figure 20. The A1758N merger from B. Ragozzine & al. . The blue contours represent the weak lensing mass reconstruction made from a background galaxy density of 24.0 galaxies/arcmin2. The outer blue contour begins at surface mass density κ = 0.07 and each contour increases in steps of 0.045 up to κ = 0.34. The red contours follow the X-ray gas mass obtained in the Chandra exposure. The NW cluster's BCG aligns with the X-ray gas and the weak lensing peak. The SE cluster's BCG and weak lensing peak are well separated from the X-ray gas, which has a bright peak near the midpoint of the two weak lensing peaks. Since no strong lensing has yet been confirmed, conclusions about cluster masses and DM would have to wait for better lensing data. 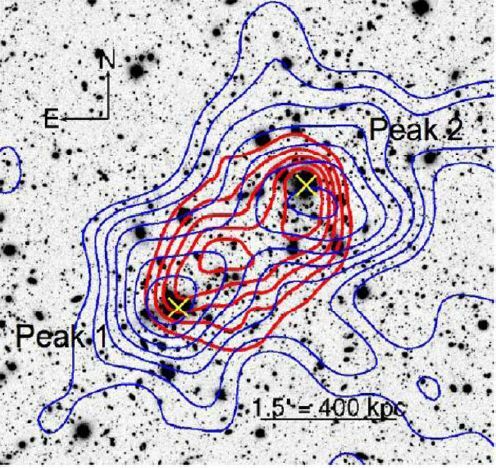 Chandra observations of the cluster Abell 2146 at a redshift of z = 0.234 have revealed two shock fronts, H. R. Russell & al. . 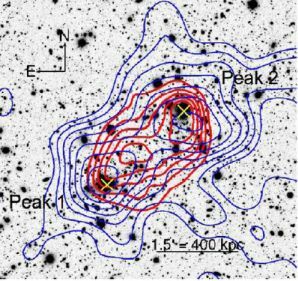 The X-ray morphology suggests a recent merger where a subcluster containing a dense core has passed through the center of a second cluster, the remnant of which appears as the concentration of gas to the NW. The strongly peaked core has just emerged from the primary core, and is trailing material that has been ram pressure stripped in the gravitational potential. This material appears as a warmer stream of gas behind the subcluster core, and trails back to the hottest region of the disrupted main cluster. Four steep surface brightness edges can be defined: two in the SE sector in front of the subcluster core and another two in the NW sector, cf. Fig. 21. The interpretation is  that an upstream shock is generated as the gravitational potential minimum fluctuates rapidly during the core passage, reaching an extreme minimum when the two cluster cores coalesce. This causes a significant amount of the outer cluster gas to flow inwards. When the subcluster core exits the main core the gravitational potential rapidly returns to its premerger level and expels much of the newly arrived gas which in turn collides with the residual infall, forming an inward traveling shock front. Behind the subcluster, the ambient cluster gas that was pushed aside during its passage will fall back and produce tail shocks. Since no weak lensing analysis is available as yet, nothing can be said about the possible role of collisionless dark matter. Newly acquired data with the Advanced Camera for Surveys on the Hubble Space Telescope, HST, shows that the cluster Abell 2744 is a complicated merger between three or four separate bodies, as analyzed by J. Merten & al. . The position and mass distribution of the Southern core have been tightly constrained by the strong lensing of 11 background galaxies producing 31 multiple images. The N and NW clumps lack such images from strong lensing, indicating that they are less massive. There is also weak lensing information from HST, VLT, and Subaru available. The joint gravitational lensing analysis combines all the strongly lensed multiply-imaged systems and their redshifts with weak lensing shear catalogues from all three telescopes to reconstruct the cluster's lensing potential, shown in Fig. 22. The Core, NW and W clumps are clear detections in the surface-mass density distribution with 11σ, 4.9σ and 3.8σ significance over background, respectively. Somewhat fainter with 2.3σ significance is the N structure, but it clearly coincides with a prominent X-ray substructure found by M. S. Owers & al. . Figure 22. The surface-mass density contours of the merging cluster Abell 2744 are shown in cyan and the X-ray luminosity contours in magenta. The peak positions of the Southern core, the N, NW, and W clumps are indicated by the green likelihood contours. The small red circles show the positions of the local overdensities in the gas distribution, associated with each DM clump. The white rulers show the separation between DM peaks and the bright cluster galaxies and local gas peaks. From J. Merten & al. .
To determine the geometric configuration of the collision, the location of shock fronts and velocities, densities and temperatures in the intracluster medium, all existing X-ray data from Chandra  were included and reanalyzed. Overlaying the lensing mass reconstruction and the luminosity contours of the emission in Fig. 23 shows an extremely complex picture of separations between the dark matter and baryonic components. Figure 23. The proposed merger scenario of the cluster Abell 2744 in time-ordered sequence. 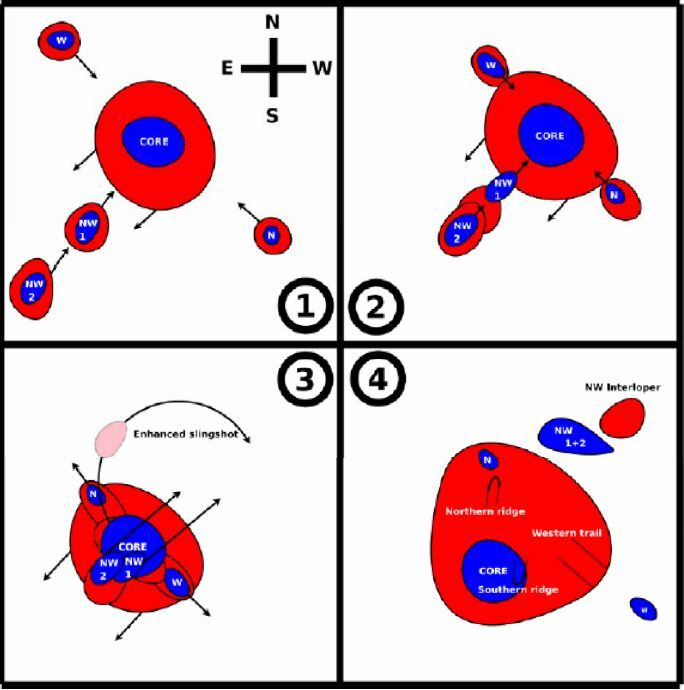 The NE-SW subclusters merge first (1) with the core, followed very soon (2) by the second merger, in the SE-NW direction. The gas slingshots (3) away to its present position at the extreme NW. In (4) we see the present setup. From J. Merten & al. . In the core region which is the most massive structure within the merging system, there is no large separation between the distributions of total mass and baryons. The separation of the peaks in the lensing and X-ray maps is similar to that in the Bullet cluster  and Baby Bullet . The Northern mass substructure is ≈ 2.6 times lighter than the Core, and the X-ray emission lags behind the dark matter to the South. The substructure in the Northwest is the second most massive and there might also be a second peak in the more Western area of the NW mass clump. However, it is difficult to ascertain whether this is a single, separate DM structure and to derive decisive separation between DM, X-ray luminous gas and bright cluster member galaxies. The X-ray peak to the Northwest of the NW2 mass peak appears to be an X-ray feature with no associated matter or galaxies, a "ghost" clump. One possible interpretation  of the complex merging scenario that has taken place in Abell 2744 is a near simultaneous double merger 0.12 - 0.15 Gyr ago. first in the NE-SW direction, cf. Fig. 23. The Western clump probably passed closest through the main cluster, as it had its ICM ram-pressure stripped completely. The second merger, in the SE-NW direction, could even have consisted of two small clumps falling into the core, attracted by the core and the Northern and Western clumps. After a first core passage, gas initially trails its associated DM but, while the dark matter slows down,the gas slingshots past it due to a combination of low ram-pressure stripping and adiabatic expansion and cooling , ending up as the "ghost" clump. This scenario still requires further observations as well as verification via numerical simulations. 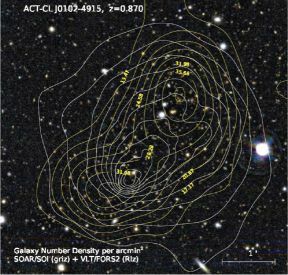 The Atacama Cosmology Telescope has presented properties for an exceptionally massive merging cluster, the ACT-CL J0102-4915 nicknamed El Gordo at redshift z = 0.87. It was discovered by Marriage & al. selected by its bright Sunyaev-Zel'dovich (SZ) effect, confirmed optically and through its Chandra X-ray data . It is the most significant SZ cluster detection to date by nearly a factor of two, with an SZ decrement comparable to the Bullet cluster 1E0657-558 . As can be seen from Fig. 24, the galaxy distribution is double peaked, whereas the peak in the X-ray emission lies between the density peaks. The X-ray peak forms a relatively cool bullet of low entropy gas like in the 1E0657-558. The steep fall-off in the X-ray surface brightness towards the SE, as well as the "wake" in the main cluster gas toward the NW, indicate that the bullet is apparently moving toward the SE. The SZ and X-ray peaks are offset similar to that reported for the bullet-like cluster Abell 2146 . In the absence of a weak lensing mass reconstruction, the galaxy distribution can only be used as a proxy for the total mass distribution. Thus to conclude that an offset between baryonic and DM has been demonstrated is yet premature. 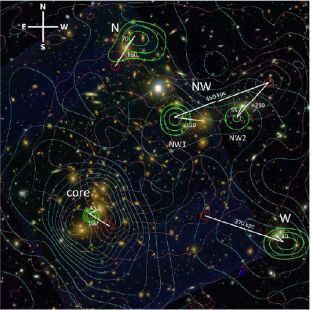 A newly discovered  major cluster merger at z = 0.53 is DLSCL J0916.2+2951, in which the collisional cluster gas has become clearly dissociated from the collisionless galaxies and dark matter. The cluster was identified using optical and weak-lensing observations as part of the Deep Lens Survey. Follow-up observations with Keck, Subaru, Hubble Space Telescope, and Chandra show that the cluster is a dissociative merger which constrain the DM self-interaction cross-section to σ mdm-1 ≤ 7 cm2/g. The system is observed at least 0.7 ± 0.2 Gyr since first pass-through, thus providing a picture of cluster mergers 2-5 times further progressed than similar systems observed to date.